A personalised monopoly board is a fun gift for a serious monopoly fan, and a fantastic way to personalise a classic game. Costing under £20, My Monopoly from Hasbro lets you create customised squares and cards using your own printer at home. 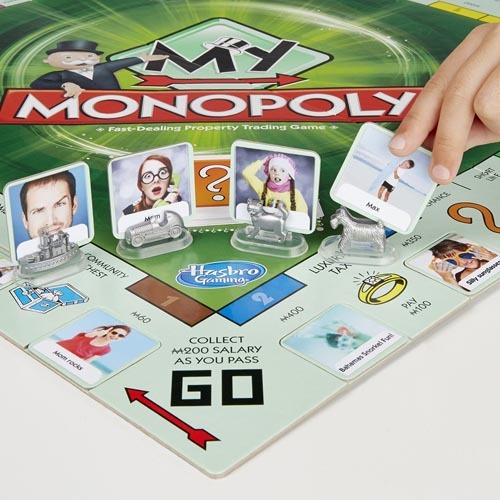 Once you buy the set, you can create an account on the My Monopoly website. From your computer or your mobile phone, you then upload pictures which are used to create personalised cards that you can print on to stickers on your own printer. Instead of Park Lane, you might have “Pete’s gaff”. Instead of “Mayfair”, you might have “Boot fair”. Be as creative as you like – just make it really personal to you and create your own personalised Monopoly set. Have you seen any other great personalised board games available? We’d love to know more about more so that we can add them to this page or why not check out this awesome guide to creating your own personalised Guess Who? This high quality travel chess set can be personalised with the addition of an engraved plaque. It costs just over £30 via Amazon.co.uk and the engraving is specified using the box for adding a gift message during Amazon’s checkout. Click here for more details.